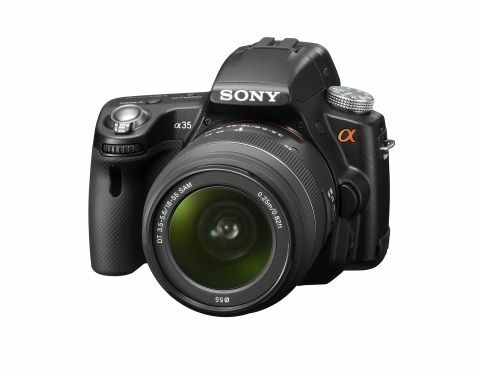 How will the Sony Alpha 35 stand up in our in-depth test? The Sony Alpha A35 is the latest launch to join the manufacturer's innovative Single Lens Translucent (SLT) camera line-up, debuting a number of new technologies that look set to turn the heads of first-time entry-level buyers and upgraders alike. SLT cameras incorporate a semi-transparent mirror that splits light between the CMOS sensor and the separate AF sensor. As the mirror doesn't need to be moved out of the way to allow light onto the CMOS, SLT cameras can offer fast full-time phase-detection AF, improving performance as a result. Not to be confused with the mirrorless compact system cameras (CSCs) that are also currently available on the market, SLT cameras differ from these in that the former uses a contrast-detect AF system, which offers a comparably slower performance. Reasons to consider the SLT system cameras in place of a DSLR or CSC are many, but the technology is not without its drawbacks. Read on to discover how the SLT-A35 fares in our in-depth tests and find out whether its speedy credentials are enough to impress. Replacing the older 14.2mp SLT-A33, the entry-level SLT-A35 boasts an upgraded featureset that - notably - includes a new 16.2mp EXMOR APS-C HD CMOS sensor, as seen in the recently-launched NEX-C3. Having impressed the photographic community with its revolutionary Translucent Mirror Technology (TMT), Sony has taken things a step further by equipping the SLT-A35 with a new Tele-zoom High Speed Shooting mode. Although the maximum burst rate remains the same as its predecessor's - 7fps - the new model enhances the performance of its continuous tracking AF by magnifying the central portion of the frame by 1.4x (producing an image at approximately 8.4mp): a bonus for sport and action photographers. There's also a respectable 5.5 fps drive mode available if you prefer to shoot stills at full resolution. TMT also means that the SLT-A35 benefits from an impressively responsive full-time phase-detection AF system that's available when shooting both stills and HD movies. The result is seamless Live View shooting that's a cut above the systems currently offered by traditional-design DSLRs. Add these features to the 1080i AVCHD movie, new Picture Effect options (which we'll discuss in more detail later), plus significantly improved power consumption performance and battery life over the SLT-A33 (440 stills compared to 340 on the earlier model) and we have what looks like a pretty complete package on our hands. That said, there's more to a camera than its feature-set, so let's take a look at how it performs.